Serendipity works in many ways, and when it comes to bringing the best and brightest people to the Kennedy Creative Events and Kennedy DMC team, we’ve been fortunate enough to enjoy a heaping helping of it. They say location is everything, and in the case of event producer Margaret Deal joining our ranks, that couldn’t be more true. Read on for insights into what makes this gracious, gifted dynamo tick, and learn about the kismet that brought her from Charleston, South Carolina to our very own doorstep. How did you become interested in the events industry? I was born into a family where the art of hospitality is seemingly innate. I cultivated a passion for entertaining that has been passed down from generations of Southerners. Growing up, I can remember both of my grandmothers and my mother hosting parties in their homes that were truly well curated events in their respective homes. They’d spend hours creating menus, the perfect cocktail recipe, ironing table linens and hemstitch napkins that had been passed down to them from other women in the family, polishing their silver pieces and setting out their personalized Lenox china to create the perfect experience at the dinner table. Seeing the amount of time and effort they spent to create such a memorable experience for the guests visiting their homes resonated with me from a very young age. As I grew older into my high school and college years, I was the designated party planner among my group of friends. I was constantly planning the next group outing (pregame, ha! ), dinner party, road trip, etc. Once I reached my junior year of college and was trying to nail down a minor degree, my advisor (who had known me since day 1 of college) suggested I look into the hospitality program at the University of South Carolina. After my first semester in USC’s Hospitality, Restaurant & Tourism Management program, it was game over. I knew this was what I wanted to do for the rest of my life. After graduating from USC, I moved to Charleston, South Carolina, one of the largest meccas of hospitality in America, where I was hired to work for a catering & event design firm that’s been officially recognized as one of the Leading Caterers of America (LCA). I grew my book of business and accounts for 4.5 years in the Holy City with my clientele ranging from social and corporate engagements, and my favorite, weddings! What led you to Austin, and how did you first learn about Kennedy? I knew that I wouldn’t stay in Charleston forever. Having lived in SC my whole life, I knew that I needed to branch out and step out of my comfort zone and see what else was out there. My boyfriend and I explored a few major US cities in 2016/2017 weighing out the pros/cons of moving to/working in each. We struck out agreeing with one another — he wanted more West coast, I wanted to stay closer to home — until we visited Austin in August 2017. After spending five days in this absolutely fantastic city, we finally agreed that this was the place! By October, he had a job offer with Dell EMC in Austin and packed his bags! 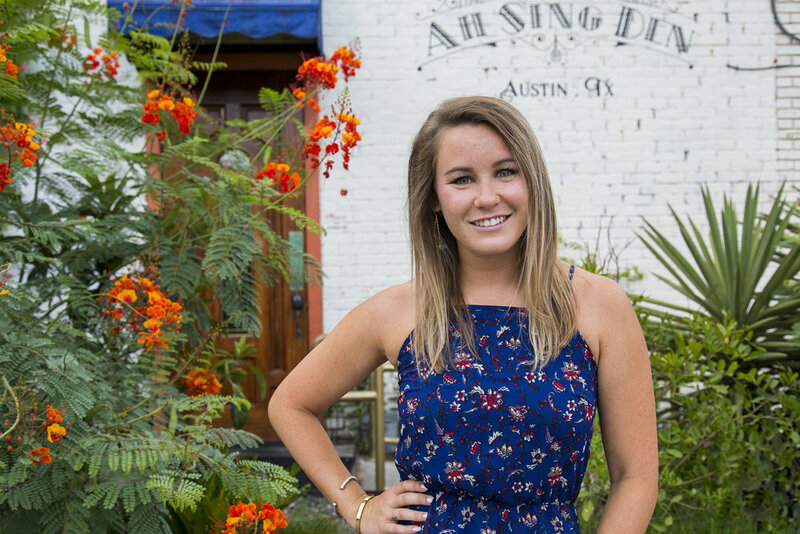 I looked into a few different avenues on my own to start my new career in Austin — boutique wedding planning firms, hotels, catering companies, and DMC companies — before I dove into LinkedIn and other platforms to see what opportunities were out there. As I was looking through job postings on LinkedIn, I stumbled upon Kennedy’s page because I had a few mutual Charleston connections with the Director of Kennedy Collection. As it turns out, she’d worked at a rental company directly behind my office building (shared the same driveway and everything!) in Charleston. I messaged her to let her know I was moving to Austin and looking for a job. She immediately put me in touch with Natalie (Kennedy) & Heather (Niemeyer) to schedule an interview with the two of them once I was settled in Austin. I met with them a couple weeks after moving to the city and felt right at home during my interview. It was like chatting with two lifelong friends! I left my interview crossing my fingers that this too good to be true opportunity would fall into place, and it did. What does your day-to-day agenda look like as an event producer? No two days are alike. During busy season, there have been days when I’ve had to figure out how to get a horse through a hotel ballroom, make 50 floral arrangements after hours, coordinate keeping a marching band completely quiet to surprise the attendees of an early morning conference, be onsite for 18 hours to set up, facilitate and strike, attend tastings with clients and caterers to customize the perfect menu — and sometimes I even get to sit at my computer and email all day which I now appreciate doing from time to time. During the slower months, I’m really just focusing on how to prepare for the busier times to come and seeing how I can help other coworkers in the office. Now, in the summer, I’m trying to travel around and host friends here in Austin… I know this September & October will be nuts with events! What, for you, are the traits or trademarks of great event production? Organization, patience, and great relationships with your vendors! You’ve also got to have a positive attitude and be flexible… sometimes nothing goes as planned onsite and you’ve got to be able to roll with the punches and relay pertinent information efficiently and calmly to your vendors/clients day of. There are many variables (weather, traffic, unforeseen emergencies) that can cause your perfectly planned event to move off course! Anticipating what could happen onsite instead of not coming prepared with back up plans B through Z will help everything flow more smoothly day of for your vendors, staff, and clients. I live on South Lamar – 78704 y’all!! I am loving the ability to walk to some of the best restaurants (Odd Duck, Uchi, Loro, Eberly), Barton Creek, the Greenbelt, and awesome live music venues like Saxon Pub. My next district I’m looking to pursue more is the Eastside. I love the vibe of the area and unique coffee shops/restaurants. This city has so much to offer, I feel like I’ll never be able to explore and see it all! I’m sure it’s been said time and time again, but it’s the people. These women (and that one guy) are INCREDIBLE and so great at their jobs. The culture here is so team-oriented and positive. I cannot say enough great things about the women that I’ve met and developed friendships with working with Kennedy. I am so very fortunate to have found such a positive group of young women being a newbie to this new city. It’s definitely helping with the transition! If you want Margaret & co. in your corner for your next big event, give us a buzz and let’s talk possibilities. Jun 13 Curious What an Austin Conference Planner Can Do? Wonder No More!